I had an intense craving for fresh fruit and veggies the other day. Since that is one of those food desires that is acceptable to give in to, I drove down the street to the local fruit market. The awesome little tienda down the road was on my list to visit anyways, as they have a wonderful selection of 7 Day candles, and we go through those fairly quickly. I love their bins of dried peppers, and they also stocks local produce, as available. The rest of their products come from Mexico and Guatemala. I merrily went home with a coconut, a pineapple, a bucket o’strawberries, a cucumber, a tomato, and an amazingly sweet watermelon! Once I was home, I realized that I’d probably gone a bit overboard on fruit for just me and Eric, so decided it was a good time to brew a quick gallon of wine. 3 lbs strawberries, washed, with greens and most of the white cores removed. They were so sweet and awesome, and local from SC! 1 lb fresh pineapple – it could have been sweeter…not bad, but I’ve had better. On the stove, I boiled just about 1 gallon of water. While that was heating, I mashed up the fruit with a sterilized masher in the sterilized bucket. When the water boiled, I added it to the mashed fruit. It smelled like strawberries and happiness! Next, it needed to cool so that I could add the yeast. I covered it with a clean towel and strapped it down to keep any fruit flies and other pests out of it. Three or four days later, I strained the bubbling mass into another sterilized bucket, stirred in about 2 pounds of sugar, and poured the whole thing into a sterilized gallon jug. The bubbling was fierce! The color was vibrant! The smell was alcoholic! In the first 6 hours of being in the jug, it blew off the airlock. I sanitized a new airlock and replaced it, and the fermentation slowed down after that. It’s been in that gallon jug now for over a week…more like 10 days, and I think it is DONE. There are no more bubbles rising to the surface, no more pops from the airlock. The sediment is settling and the wine is clearing. The next step is bottling, and then the waiting, and finally the drinking! Bottling Update: Well, I must say that it’s lackluster. *sigh* The amazing, potent, heady strawberry scent has vanished, and left only a tiny trace of flavor, and the yeast nommed up ALL of the sugars. It’s very dry, and definitely alcoholic! But not all is lost! I bottled it anyways, and labeled the bottles with the flavor and date. I also made a note to add a Simple Syrup to jazz them up when I open them for use. Maybe even a Strawberry or Pineapple flavored simple syrup using fruit juice…mmm…. I think that my mistake was that I used standard activated kitchen yeast. I know that it works, but I really do prefer the sweet mead yeast that I get from the brew shop. I’ll have to bite the bullet and buy some more! Maybe it would be good mixed in with some fruit juice or 7up? Just a thought anyways. Whenever I’ve gotten a wine that I think is too dry/not sweet enough mixing it with 7up and/or fruit juice works for me. I don’t like wasting that alcohol either lol. Hi, Amber! I think you are probably right in guessing that the yeast was the culprit. I’ve used kitchen yeast before (the muscadine came out delicious! ), and it worked fine, but other times it was bad. 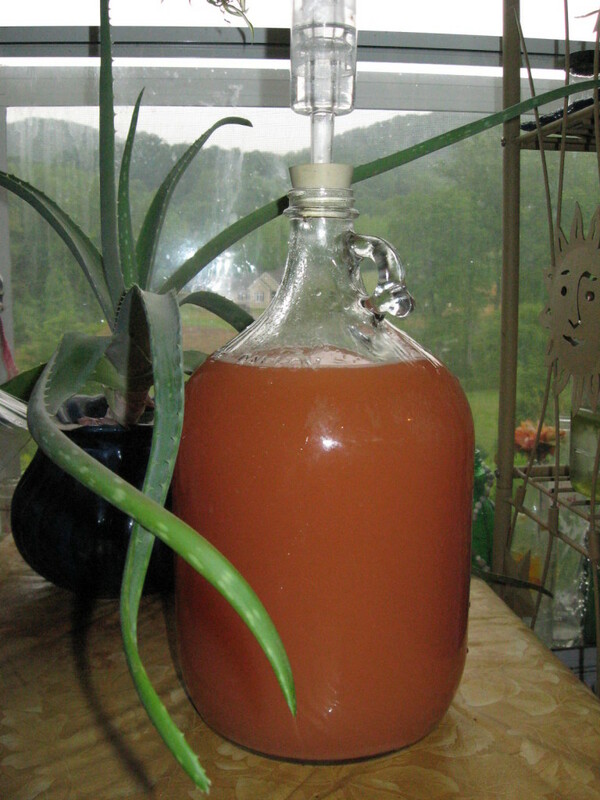 I used kitchen yeast in my last batch of strawberry wine and it was too dry also. I used champagne yeast once in a strawberry wine, and I think it was the best I have made. “Light” aromatics like that fresh strawberry scent are incredibly hard to capture. If you ever get the chance to snag some specialized champagne yeast, stock up; they tend to destroy less of the delicate fruity goodness. Where is this tienda? Hendersonville and Mills River are quaint, but I’ll be damned if I can find any decent 7-day candles or specialty herbs without spending an entire day hunting them down. L.M. Tea: That’s a trick I use for dark red wines. I’ll put sprite or ginger ale in burgundy, merlot, or any other red wine when it is too tannin-heavy, or starting to turn. 🙂 Maybe some strawberry nectar would be good at adding some sweet flavor! Connie: Champagne yeast isn’t my favorite, but there’s a sweet mead yeast that rocks my socks. 🙂 It keeps it from going too dry, like the champagne yeast does, in my opinion. Next time, I’m going to try using two bucket fermenters, and adding fruit to the secondary to try to kick it up a notch in flavor, and yes, a proper yeast! Pallus: I forgot you were local! 🙂 It’s on Smoky Park Hwy in Candler, a bit before the Food Lion. Called Farmer’s Best, or something similar? You can also find 7-days in a lot of random cheapy and outlet shops around here. A lot of my herbs that I can’t wildcraft myself, I’ll get from markets online! This sounds amazing. We will take the tips from your updates and implement them! We are in SC- less than 2 hours from you!